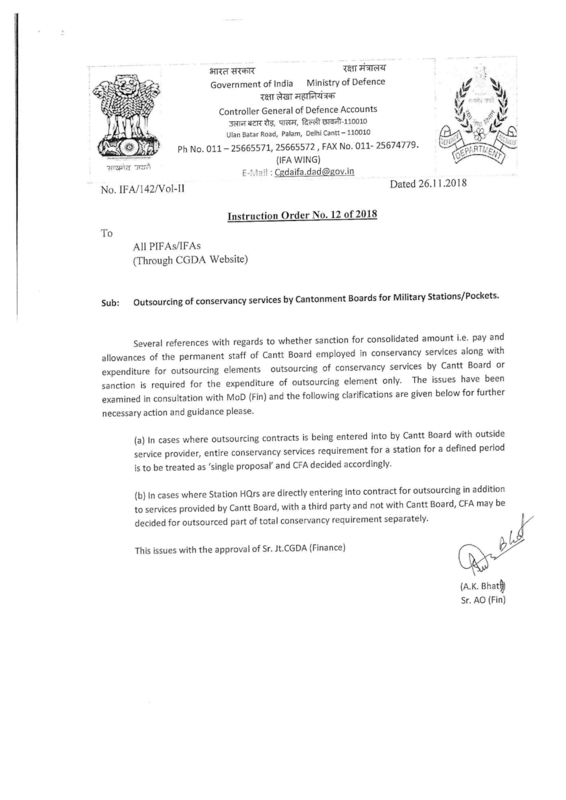 Sub: Outsourcing of conservancy services by Cantonment Boards for Military Stations/Pockets. 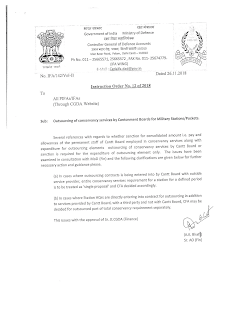 Several references with regards to whether sanction for consolidated amount i.e. pay and allowances of the permanent staff of Cantt Board employed in conservancy services along with expenditure for outsourcing elements outsourcing of conservancy services by Cantt Board or sanction is required for the expenditure of outsourcing element only. The issues have been examined in consultation with MoD (Fin) and the following clarifications are given below for further necessary action and guidance please. (a) In cases where outsourcing contracts is being entered into by Cantt Board with outside service provider, entire conservancy services requirement for a station for a defined period is to be treated as ‘single proposal’ and CFA decided accordingly. (b) In cases where Station HQrs are directly entering into contract for outsourcing in addition to services provided by Cantt Board, with a third party and not with Cantt Board, CFA may be decided for outsourced part of total conservancy requirement separately.